Present Owner: Keystone Pioneer Museum Inc. This former farmhouse is a rare Manitoba example of a Ukrainian vernacular-style residence possessing a traditional grass-thatch roof. 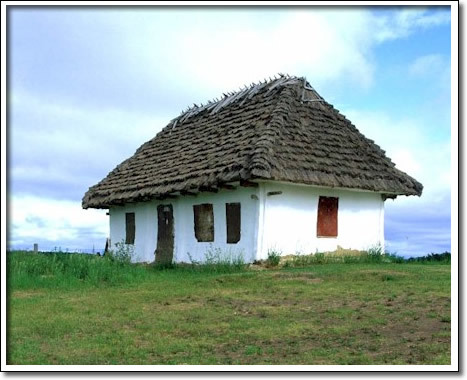 It is also one of the province’s best surviving examples of the Bukovynian regional style of Ukrainian folk architecture, featuring a south-facing rectangular plan, three main interior spaces with a centrally placed doorway, and a large hip-shaped roof with wide overhanging eaves. Constructed in 1910 by its owners, the house was occupied and maintained largely in its original form by the family until 1951. It was built almost entirely of natural materials obtained from the homestead. The structure never possessed a chimney, a trait common to a much earlier period of Ukrainian folk housing. Smoke from the cookstove was simply directed up through the ceiling and allowed to filter through the thatched roof. This allowed the attic to be used as a smoke-chamber for curing meats, helped to preserve the thatch and keep it free from vermin, and kept the house warmer in winter by heating the attic. In 1987, the Elaschuk House was moved from its original Boggy Creek location 30 kilometres south to the grounds of the Keystone Pioneer Museum.